About Shokhrukh I. Message Shokhrukh I.
Shokhrukh is a young and energetic boy. His planning was perfect. He was ever helpful to me and did everything to make me comfortable in Uzbekistan. He loves his country and made me fall in love with Uzbekistan. It was my first visit to any country in central Asia. Before the tour, I was anxious about everything, the country, the people, the food, the transport, but as the tour progressed everything seemed so easy and beautiful. Please do visit Uzbekistan. It is much better than the pictures you see ! TOUR GUIDE RESPONSE: Dear Dinesh, Thank-you so much for your feedback. I am really excited that you liked the tour. 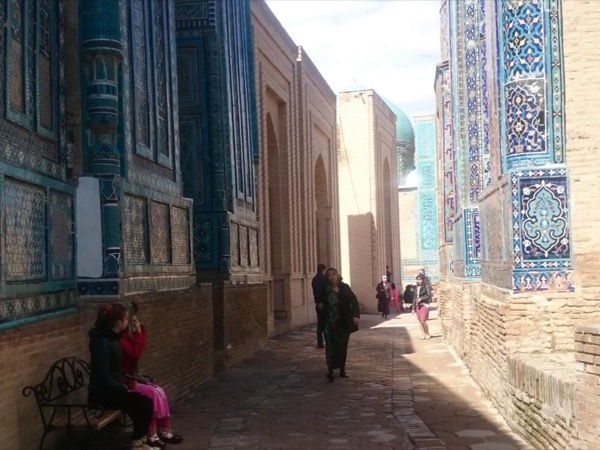 A lot to see in just 9 days between Khiva and Tashkent. A lot of information to share and time together to make it happen. Never late, always good-humoured and easy to adapt the itinerary if and when needed, Shokhrukh and his drivers showed us the best of Uzbekistan in a very relaxed and easy going manner. Being a vegetarian in Uzbekistan is not always easy, but we managed. And also due to glorious weather/continued blue skies the trip was a joy together with him. We liked it. We had already met Shokhrukh on our tour of Tashkent and were very happy to see him again for a tour of Samarkand. As before, he was very knowledgeable about all the places we visited and extremely accommodating of our interests and needs. He added on a visit to a local synagogue on-the-go when we expressed an interest in seeing one, and also helped to arrange transportation for us for a subsequent day. He also carried my young daughter up and down several flights of stairs! :) All very much appreciated! TOUR GUIDE RESPONSE: Thank you a lot for the feedback, Stacy. I'm glad you liked it. Wish you all the best. We really enjoyed our day in Tashkent with Shokhrukh! We were travelling with my young daughter who uses a wheelchair and this was no problem. He was incredibly helpful and accommodating with our schedule and went out of his way to fill our time and make sure we saw as much of the city as possible in one day. He has a good way of explaining and describing things and was friendly and comfortable to be with. We would be happy to recommend Shokhrukh to anyone visiting Tashkent! TOUR GUIDE RESPONSE: Thank you Stacy. I hope you will come again after big reconstructions. Shokhrukh was a great guide and translator who was as enthusiastic about our art project as we are! His approach to local people and his diligence in translating their videotaped responses was admirable. He was also a great companion with an excellent knowledge of his country and its people. We enjoyed our time with him immensely, and thank him for showing us a bit of Uzbekistan in the short time we were there. TOUR GUIDE RESPONSE: Thank-you very much. Good luck with your art project. I will keep eye on it. I and my friends have travelled almost all around the world but the hospitality and cozy atmosphere that we felt from Shakhruh and our driver Temur was exclusive. They were with us from early morning, trying to show and give us the best of their country. Its real value for money and you really need good host while you are in Uzbekistan. TOUR GUIDE RESPONSE: Thank you for visiting Uzbekistan. It was wonderful time with you. Hope to see you again. Best wishes to you. Shokhrukh is a very good guide. Very caring and helpful. We were 5 and the flexibility makes the difference in this tour. Meaning we had the choice of doing what we wanted every single day, following the program wasn't necessary. Another good aspect was that with Shokhrukh we had a more local experience as well. Meaning we didn't just see the touristic places but also local markets, non-touristic districts etc. This was only if you wanted of course. To conclude definitely a five star tour. TOUR GUIDE RESPONSE: Thanks a lot, Mehmet. I am happy that You liked the tour. I also enjoyed the moments with you all. Yakında görüşürüz. First rate tour guide. Prompt, friendly, conscientious. He listened to what I wanted and cheerfully provided it. Strongly recommended! TOUR GUIDE RESPONSE: Thanks so much. It was my pleasure getting to know you and hope to see you back again. A fascinating tour with a young, energetic and responsive guide. He showed me all the sights as I had expected, but he also provided an historic context to a culture that was new to me. I particularly appreciated his flexibly; at his suggestion we added a night in the desert at a yurt camp, complete with a camel ride! His English was excellent. He was very proud of his country and helped me appreciate its history as well as its contemporary life. TOUR GUIDE RESPONSE: I am happy to read this positive comment. Thanks. I will not stop working hard to make tours better. Hope to see you again in Uzbekistan. Fantastic country to visit-full of history;beautiful Islamic architecture and history;very kind people; very clean country. TOUR GUIDE RESPONSE: Thank you very much. This is a great honor for me to help people discover Uzbekistan.